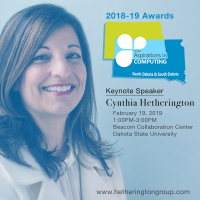 (Wanaque, NJ) Cynthia Hetherington, Hg’s founder and president, will inspire young high school women on April 2nd at the 2018-19 Aspirations in Computing Awards (AiC) ceremony hosted by Kean University, Rutgers University, and The College of New Jersey. 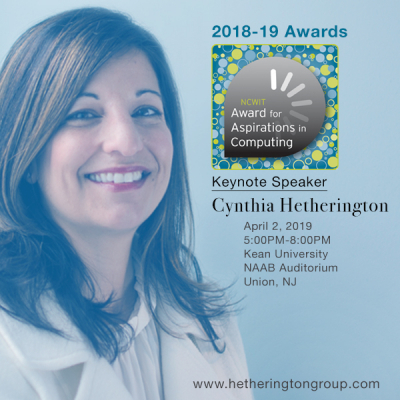 The National Center for Women & Information Technology (NCWIT) AiC awards will be bestowed upon 27 New Jersey high school women who are active and interested in computing and technology. 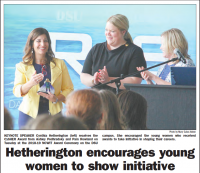 The Kean Foundation will provide two $5,000 scholarships to students involved in NJ NCWIT; The College of New Jersey is offering a scholarship of $5,300 to a winner of the NCWIT Award for Aspirations in Computing; and Rutgers University is offering a “Rutgers Aspirations in Computing” Scholarship in the amount of $1,000 for their first year at Rutgers to all the winners of the NCWIT Award for Aspirations in Computing National Award, and all of the winners of the NCWIT Award for Aspirations in Computing New Jersey Affiliate and Philadelphia Affiliate Awards. 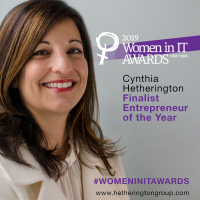 In January, NCWIT announced the 2019 NCWIT Award for AiC national recipients, honoring four hundred women in high school from all 50 States, the District of Columbia, Puerto Rico, the U.S. Virgin Islands, Guam, and all U.S. overseas military bases.